If you are considering purchasing a new smartphone then two of the hottest phones that you may come across at the moment are the LG G2 and the Nokia Lumia 925. The first is an Android handset while the second uses the Windows Phone platform. Today we have a video to show you of the LG G2 vs. Nokia Lumia 925. There are huge amounts of popular smartphones out there right now, and when thinking of a new device it can be really difficult to know where to begin. That’s where video comparisons can often be really helpful. One of the major differences between the LG G2 and Nokia Lumia 925 is the different operating platforms. However, if you’re open to either an Android or Windows Phone handset then these are two devices that you might be thinking about. Below this story we’ve embedded two YouTube videos as this comparison comes in two parts. It’s a comprehensive look as the review totals over 20-minutes and will give you a really good idea of what both of these phones have to offer. The first video mostly covers the hardware and begins with details of specs for each phone followed by a tour around the handsets. It then proceeds with a quick look at the Android and Windows Phone 8 software and user interfaces of each, performance, displays, and more. The second part of this comparison starts with a look at the designs, and then focuses on the software, apps, features and personalization options. Camera capability is an increasingly important factor to many people and the video also compares the camera set-ups and what they have to offer. We won’t spoil the final conclusion for you but both are high-end devices on their respective platforms and your decision will depend very much on what is most important to you. You may agree or disagree with the phone that’s chosen as the winner depending on your own preferences. 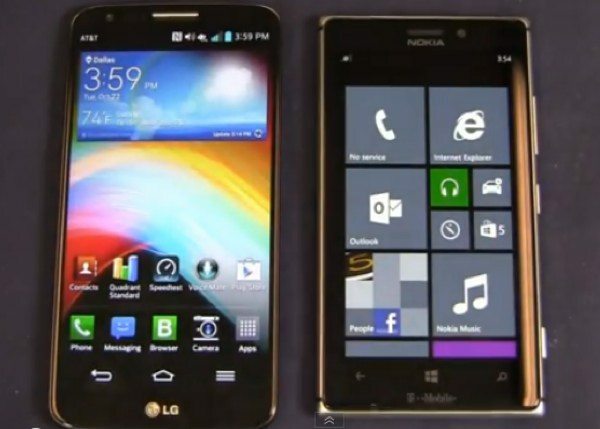 Are you considering buying either the LG G2 or Nokia Lumia 925 smartphone? Is build and design important to you, or is it all about the specs? Let us have your comments.